Nothing is better than spending a night outside making a great meal with your very own grill. If you enjoy grilling and making some great food, you will soon realize how important it is to have a quality grill. While many people choose to purchase a lower-priced grill, it often makes far more sense to buy a higher-quality grill that will last for much longer and provide you with a much better grilling experience. There are several things that you should look for when you are shopping for a grill that will last. As you are shopping for a new grill, you will also want to find one that has accessories available. While most grills come with at least a couple base burners, there could come a time when you want to purchase a few additional products that will allow you to make even some more fun and unique dishes. Some of the top accessories to look for can include side burners, warmers, carts, and even rotisserie cookers. All of these accessories will be easily added on to your grill to give you the best experience possible. When you are looking for a new gas grill, you will also want to find one that comes with a warranty. One of the most telling signs that you are getting a great product is that the manufacturer is willing to stand behind it. When you purchase the PGS Grill, you will be able to take advantage of one of the best warranty options available. This warranty program will provide you with a lifetime warranty on the burners and major components as well as a one-year parts replacement warranty. This ensures that if you have an issue with the grill, PGS will make the necessary repairs for you. Similar to many other products, you will want to get a grill that is produced by a reputable and reliable manufacturer. 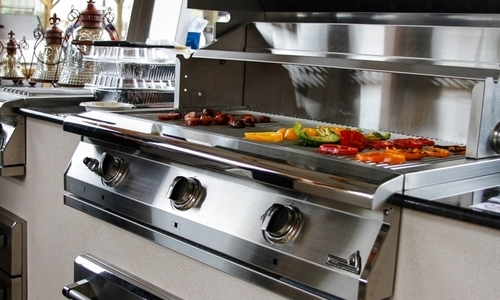 PGS is one of the leading grill manufacturers today due to their great products and customer service. The company works hard to provide you with the information you need to make the right grill buying decision. They will then be able to provide you with any ongoing support you need to ensure you are able to enjoy using your grill as much as possible. Depending on what and how much you want to grill, you may need to be able to achieve a high heat quickly. The best measurement that is used for this purpose is BTUs. For many people, getting a grill that has no more than 30,000 BTUs is more than sufficient. However, if you want a grill that can handle more volume, you may want more. Today, some of the larger PGS grills can provide you with up to 67,000 BTUs, which is more than enough for almost all grillers. Finally, you should also consider getting a grill that comes with ceramic rocks for heat distribution. Over the past few years, ceramic rocks have continued to become the heat distribution option of choice. Ceramic rocks are designed to evenly distribution heat all over the grill while also minimize flare-ups. This is a great features that will allow you to control the temperature of your food even when you are cooking meat with a lot of grease or have the gas on too high. This simple upgrade is often considered one of the best returns on investment when it comes to gas grills. Ultimately, when you are shopping for a gas grill, getting one with all of these features will ensure it is durable and is built to last. This will allow you to enjoy a great grill for years to come while not having to worry about repairs or replacements.